To view 2 more pictures, interactive maps and the full, detailed description of the Rosecrest at West Neck (55+) community, please Login. It’s easy to find new homes in Rosecrest at West Neck because they offer stylish houses for sale. The builder catered to every homebuyer’s request when he built these residences. Small enough to require little upkeep and large enough to give plenty of living space, these homes are just the right size for those 55 and up. This community is located in the West Neck section of Virginia Beach, VA, which allows owners to quickly access medical facilities, the commissary and the Navy Exchange on military bases like NAS Oceana and Joint Expeditionary Base Little Creek-Fort Story. Homebuyers can choose from around 10 different models of these houses for sale. It may be difficult to find new homes where the builder took such measures to ensure excellence in Hampton Roads. Each residence in Rosecrest at West Neck may feature 30-year architectural shingles, double rear floodlight, garage with oversized door complete with remote, completely sodded front and backyard, concrete patio, GE appliances, rocker light switches, vaulted ceilings, gas fireplace with slate surround, ceramic tile flooring and much more. To find new homes with everything you want on the inside is not so hard, but to find new homes with everything you want on the outside too, well that’s a different story altogether. The amenities that come with purchasing one of these houses for sale are fine indeed. Living at Rosecrest at West Neck means living in the shadow of an Arnold Palmer legendary golf course. The Signature at West Neck is a golfer’s dream come true with a challenging course comprised of green, grassy fairways. This facility also sports a 24,000-square-foot clubhouse, which is perfect for celebrating those hole-in-ones. This builder really knew what he was doing to construct such a nice development in this region. Virginia Beach is a mecca for those seeking active lifestyles. Sandbridge Beach is just a short drive away and shows how the Virginia coastline could rival any of Florida’s beaches. Community centers invite lifelong learning pursuits and the Virginia Beach Sportsplex entertains the fans. Tour houses for sale and see how they can improve your life. Not every residence was made by a builder who cared so much for quality. If you’re 55 or better, see how easy life can be in Rosecrest at West Neck. 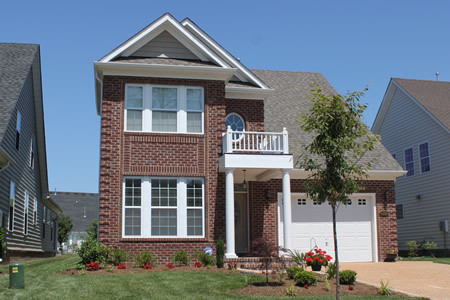 Send me more information about the Rosecrest at West Neck (55+) new home community.